During the Spring and Autumn Period (770–476 B.C. ), the king of the state of Jin sent a diplomat to visit the state of Lu. One sunny day, on his way back to Jin, the diplomat passed through the state of Ji. There, he saw a farmer weeding in a field and a young lady, who seemed to be his wife, approaching the farmer with lunch. The young woman served lunch to the farmer by holding the plate with two hands in a very respectful manner. Likewise, the farmer took the food in a respectful manner. While the farmer ate his lunch, his wife stood to the side waiting politely. The diplomat was very much impressed by what he saw, thinking “They treat each other with such respect!”He walked up to the couple and talked with them, then invited the couple to accompany him to Jin. He then recommended the farmer to the king. The king took his advice and put the farmer in an important position in the state of Jin. 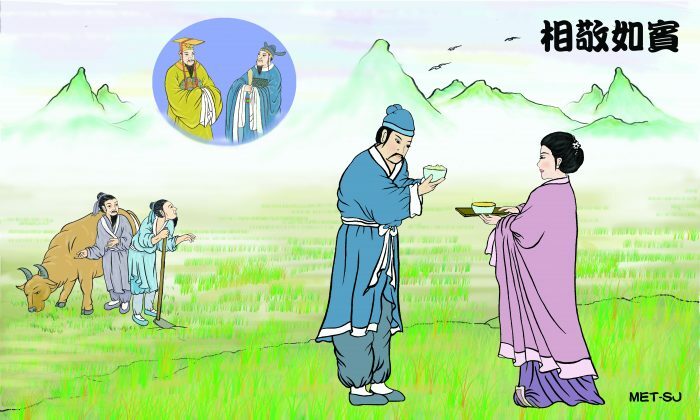 The story was based on text included in Zuo Zhuan (1), one of the earliest Chinese works of narrative history, which covers most of the Spring and Autumn Period. Later, the expression相敬如賓 (xiāng jìng rú bīn), which translates as “treat each other with the respect due a guest,” became an idiom. It is used to describe how a couple should treat each other with mutual respect.